A Computerized Tomography (CT) scan is one of the most advanced and accurate forms of diagnostic imaging available. It provides you and your physician with important information regarding your health and well-being. 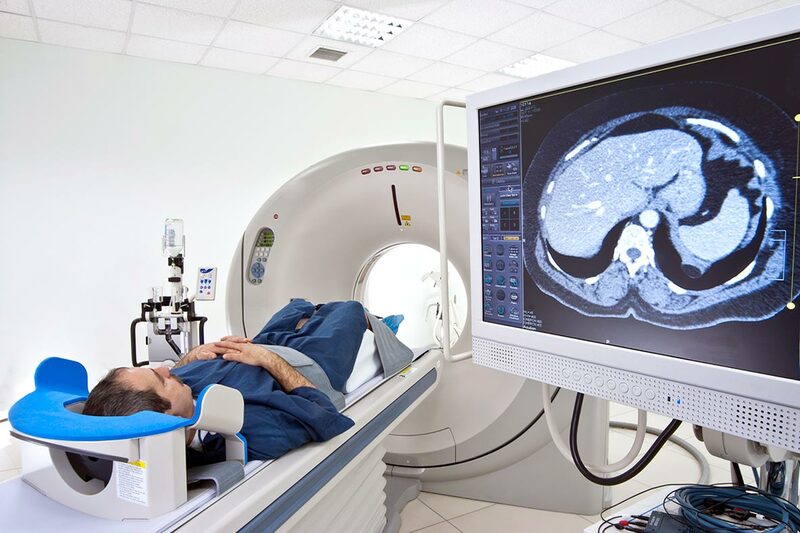 During a CT scan, a narrow X-ray beam and a computer are used to create a series of cross-sectional images of your body that assist in the diagnosis of many injuries and diseases. The CT scanner is a large, square machine with a hole in the center and a remote-operated table that moves up and down, and slides into and out from the center. Within the machine, an X-ray tube moves around your body to produce the images. As metal objects can affect the image, do not wear clothing with zippers and/or snaps. You may be asked to remove jewelry, eyeglasses, hearing aids and any removable dental appliances that could obscure images. You may be asked to refrain from eating for 3 hours prior to your exam. You may always have clear liquids (water, clear juice, Jell-o, broth) until your appointment and please take your daily medications unless otherwise instructed by your physician. Women should always inform their doctor or the technologist if there is any possibility that they are or could be pregnant or are breastfeeding prior to a CT Scan. Depending on the part of the body being imaged, some CT scans require the use of contrast/dye, which is either swallowed and/or injected into a vein to highlight the normal parts of your body during the exam. Before administering contrast, the technologist will ask you if you have any allergies—especially to medications or iodine—and whether you have a history of diabetes, asthma, kidney problems or heart conditions. These questions help staff determine if the contrast is safe for you. Your physician may ask to have a blood test prior to your CT Scan to make sure your kidneys are functioning properly. Please bring a current list of medications with you to your appointment. If you are having your abdomen and/or pelvic area imaged, you may be asked to swallow a contrast material prior to the scan. This oral contrast is given in the CT scan department after your arrival and can take 30 minutes to 2 hours before your exam is begun. We have a private area with a television, reading materials, and Wi-Fi for your convenience. The staff will monitor you and always be available for questions and concerns. One of Cooley Dickinson Hospital’s Radiologists will review your CT scan and forward the results to your physician within 24 hours of your exam. Please contact your physician directly for results. If you wait for the CD at the time of the scan, it takes about 30 minutes, and the written report from the Radiologist will not be on the CD at that time. If you would like to pick up your CD at a later date, please call 413-582-2467 to request them 24 hours in advance. Film pick-up is available Monday through Friday, 8 a.m. to 4:30 p.m. at Cooley Dickinson’s Film Library. Please drive around the back of Cooley Dickinson Hospital to the MRI parking lot and come in the MRI entrance. Take a right to the Film Library. Please allow 15 minutes to pick up your films/CD. We want your experience at Cooley Dickinson to be as comfortable as possible. If you have any questions or concerns prior to your exam, please call us at 413-582-2207. Thank you for allowing us to care for you and for choosing Cooley Dickinson Hospital for your health care needs. At the start of your exam, the technologist will position you on the CT table, usually lying on your back. If intravenous contrast is needed for your exam, an IV will be placed in your arm at that time. As the study proceeds, the table moves up and into the center of the CT scanner. It is very important that you hold still for the pictures so the images are not blurry. Depending on the area of the body being examined, you may be asked to hold your breath for a short period of time. You may notice occasional clicking and whirring sounds as the tube moves around you. The technologist will be able to see, hear and speak with you throughout the exam. CT scans take between 5 and 15 minutes. CT scanning is not painful. When the exam is over you may be asked to wait until the images are examined in case more images are needed. A parent may accompany a child during the exam.